It is officially summer, also known as Southcoast season around here. We think summer is the perfect time to kick back and relax, and our weekend wear has a sneaky way of creeping into our weekday wardrobes. Today we’re sharing a little style inspiration from one of our closest blogger friends, Olivia of Livvy Land. She has Southcoast style down to a tee, and we want to live in her casual-cool world. Here she shows us how to wear two of summer’s must-have styles: a drawstring crossbody with a boho vibe and a backpack with effortless ease. 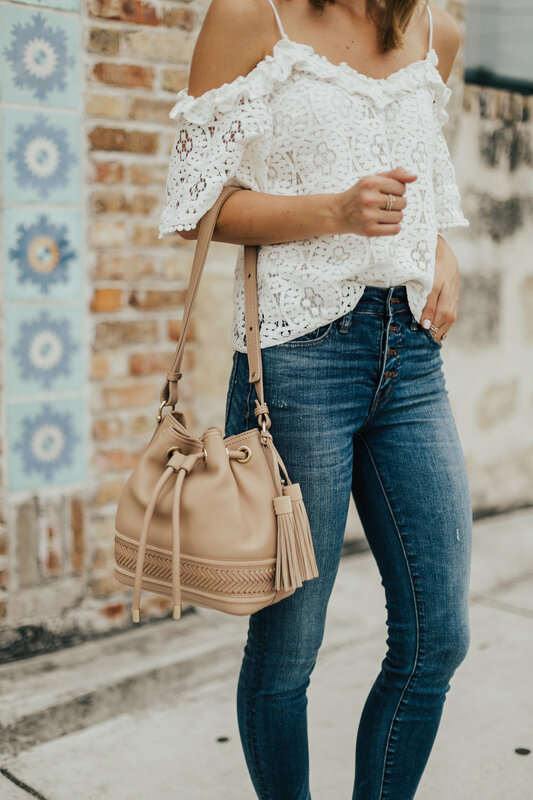 The Josie Backpack and statement earrings are all you need to jazz up jeans and a white top. Have a wonderful weekend, and don’t forget to shop the full Southcoast collection. Posted on June 23, 2017 by Brahmin Handbags and filed under Bloggers & Fashion and tagged Southcoast Blogger LivvyLand.